A 17-minute walkout is planned at several area schools this Wednesday to protest school violence. Students across the Hillsboro area are planning to join a nationwide school walkout on Wednesday, exiting class in protest against gun violence in schools. Students at Glencoe, Hillsboro, Century and Liberty high schools plan to walk out of classes at 10 a.m., Wednesday, March 14 for 17 minutes, joining more than 2,500 schools protesting against school violence after 17 people were killed in a mass shooting in Florida in February. Women's March Youth EMPOWER, which has called for the walkouts, argues Congress has been dismissive about changing laws that could prevent mass shootings and protect the public. "We need action," the group wrote on its website. "Students and allies are organizing the national school walkout to demand Congress pass legislation to keep us safe from gun violence at our schools, on our streets and in our homes and places of worship." Peter Wedlake, 17, organized the Glencoe High School walkout. The high school senior said students have had enough with inaction from the state and federal government. "We want to put forth our support for the cause, and show disdain for the lack of movement on this issue from the state and federal government," he said. March 14 marks the one-month anniversary since the shooting at Marjory Stoneman Douglas High School in Parkland, Fla., where 14 students and three staff members were killed. Many others were wounded in the shooting. Women's March Youth Empower is calling on students, teachers, school administrators, parents and allies to take part in the 17-minute walkout in honor of the 17 lives taken. "It's 17 minutes of silence," Wedlake said. "One for each of the victims." 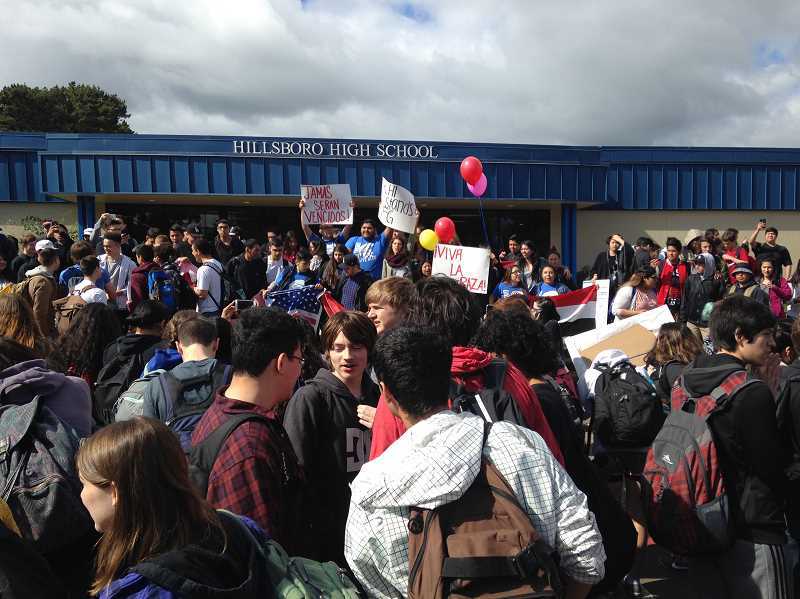 If students do march out of Hillsboro schools, district officials say they'll let them. Beth Graser, a spokeswoman with the Hillsboro School District said demonstrations are planned at all four of Hillsboro's high schools and likely at its middle schools. Graser said the district's school resource officers will be at each school to ensure student safety on Wednesday, but Graser said students won't be punished for participating in the short demonstration. "There is a fine line to walk between enforcing normal school rules (e.g. being in class) and honoring students' rights to freedom of speech, expression, and peaceful assembly," Graser said. Graser said the district is neither encouraging nor discouraging students from participating, but have asked students to stay on campus and find other means of expressing themselves. "There are many ways to have your voice heard, including writing to your legislator or to the local newspapers, having a discussion about your concerns, and participating in activities outside of school hours," the district wrote in a letter on its website this week. Wedlake, said he was horrified by posts online of students afraid to go to school because of threats of gun violence. He was equally shocked to hear Republican lawmakers say no changes to gun laws were necessary to prevent school shootings, he said. "It's hard to see these conservative Republicans online and in town halls saying this is what the people want. It's not," he said. "As high schoolers we have more capacity for empathy. This is enough." The 17-minute walkout is one of several national walkouts and vigils being planned over the next several weeks. Organizers are also planning The March for Our Lives in Portland on March 24, and an April 20 walkout to remember victims of the shooting at Columbine High School. Wednesday's walkouts won't be the first time Hillsboro students have marched out of class. In 2016, students at Forest Grove High School walked out of classes after a student hung a banner promoting plans for a border wall between the U.S. and Mexico. That sparked similar walkouts in schools across the Portland area, including several in Hillsboro. A year later, students at South Meadows Middle School and Liberty, Glencoe and Hillsboro high schools staged protests against President Donald Trump's administration for its stance against so-called "sanctuary cities." Wedlake said the 2016 election and the shooting in Florida has woken people up about getting involved politically. "It's created a passion for people who normally wouldn't participate," Wedlake said. "They want to have their voices heard."